Coco is the well-respected, if somewhat easily startled Chief of Police in Buenos Aires. Alberta is his more sensible cousin. Together they crack the cases that confound this puzzling city. Alberta is helping her cousin Coco, the Chief of Police, solve a top-secret case. In the beautiful Japanese garden of Buenos Aires, one daffodil will not stop drooping. Is someone trying to destroy the serene beauty of this oriental oasis? Ursula Dubosarsky is widely regarded as one of the most talented and original writers in Australia today. Her work ranges from multi-award-winning novels for older readers like Abyssinia, Theodora's Gift, The Red Shoe and the 2012 CBCA shortlisted The Golden Day, to her highly-acclaimed and hilarious picture books with Andrew Joyner such as The Terrible Plop. 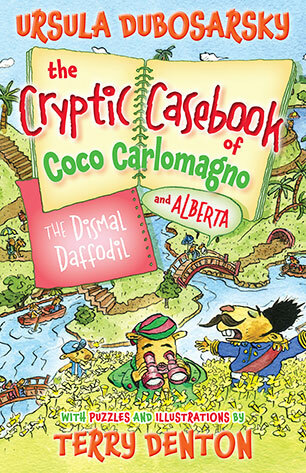 Ursula has also collaborated with Tohby Riddle in their unique and award-winning series that takes an entertaining journey through English language, The Word Spy and Return of the Word Spy. Terry Denton has written and illustrated many popular and funny books, including Gasp! the breathtaking adventures of a fish left home alone, the madly inventive Storymaze series and his books for younger children about Wombat and Fox. He is also a long-time collaborator with bestselling author Andy Griffiths and their books, including The Cat on the Mat is Flat, The Bad Book and the hilarious Just! series, have won every children's choice award in the country.